Do you need support at this time? What is your burning question? What are your (hidden) fears? There is more guidance available to you right now. You have many helpers on the other side: Your God, your Soul or Higher Self, Angels, Helpers and Spirit Guides. Spirit Guides are known to be by our side to deliver teachings and advise as we walk our earthly journey. They were with you at the time of signing your soul contract, at the time of establishing purpose before you were born. You have many Guides on your journey that assist you with purpose, career, life and other issues you may be faced with. They understand our humanness as they may too have been in human form before. They will show you how to create the best outcome for the challenge you are faced with at this time. Be open to their counsel and receive the intention that is always for your highest good. The Spirit Guides often show you that which you cannot see. Ask them today to help you out. 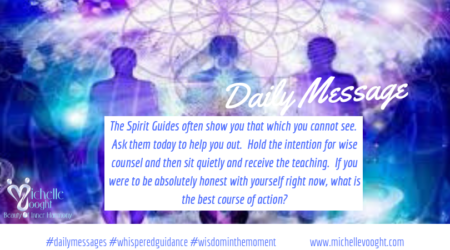 Hold the intention for wise counsel and then sit quietly and receive the teaching. If you were to be absolutely honest with yourself right now, what is the best course of action? Follow up on ideas, talk to others; listen without judgement, without preconceived ideas. Listen and receive wise Guidance. Your Master Teacher Guide can assist you with those important learnings and fears that you need be aware of so you can BE YOU and believe in your highest potential. Your Runner Guides can assist you with those day to day tasks and support you need and also connect you the people you need in your right life now. Ask your Question, call on help and receive the truth as it is presented to you. Raise awareness to those nudges and creative solutions.